Bear Hands just feels like it’s from Brooklyn, and what do you know — that’s home for the quartet. While embracing some of the afro-pop influences of fellow Brooklynites such as Yeasayer (or LA-based contemporaries Local Natives), Bear Hands has always headed towards a more danceable direction. 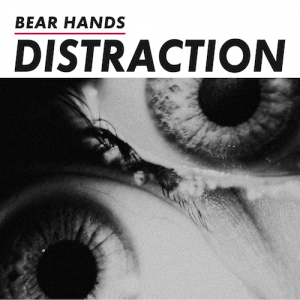 Distraction, their second full length, is the band’s statement of purpose, written in poppy bursts of energetic synth and guitar. the vocals above glimmering synths like Animal Collective in a Jacuzzi before launching into a barrage of drums, while the album’s lead single “Giants” is a fast-talking piece of dance-punk a la Passion Pit. When the vocal melodies feel too mid-2000s pop punk , however – which is every few songs – those quiet guitar atmospherics could use a slight boost in the levels. Apparent in the second half of the album during tunes like “Bad Friend” and “The Bug,” Dylan Rau’s measured talk-singing is the one element giving off a sense of self-assured detachment. But it brings down the musical boisterousness, until “Thought Wrong,” with a quiet croon and some horns, gives the sense of a completely different band. A band not so confident in itself but reveling in that uncertainty — uncertainty is possibility.